For many, the dining room serves as the very heart of the home – it's where families gather to share the stories of the day, where old friends can make new memories, where doodles and work documents can stretch their legs. 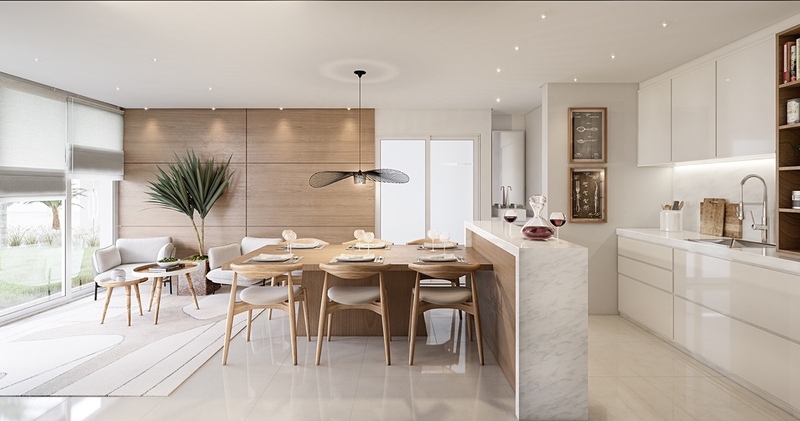 This post features 25 gorgeous dining rooms that remain simple without feeling minimalistic, using smart materials and furniture choices that underscore a sense of elegance without dominating the landscape. 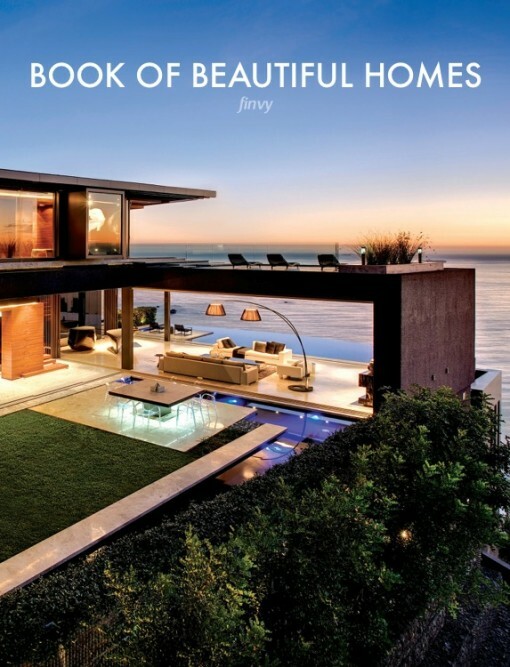 Each has a distinct personality despite the similarities, each catering to different tastes and space constraints. 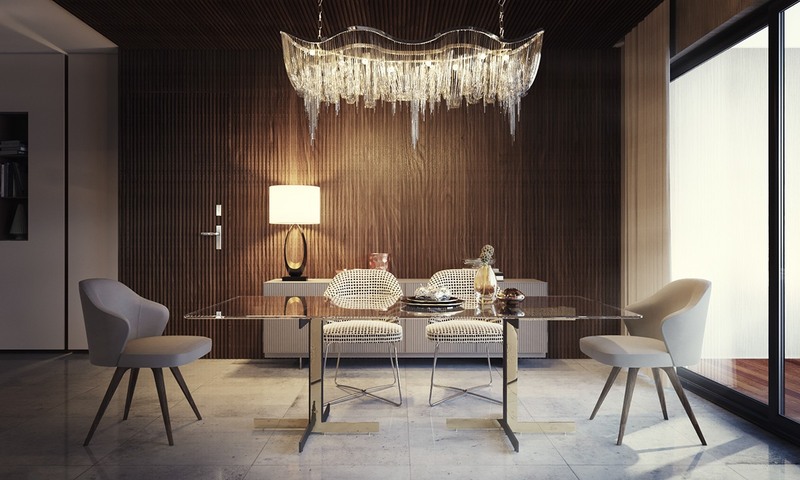 Which dining room design suits you best? Comment to let us know! 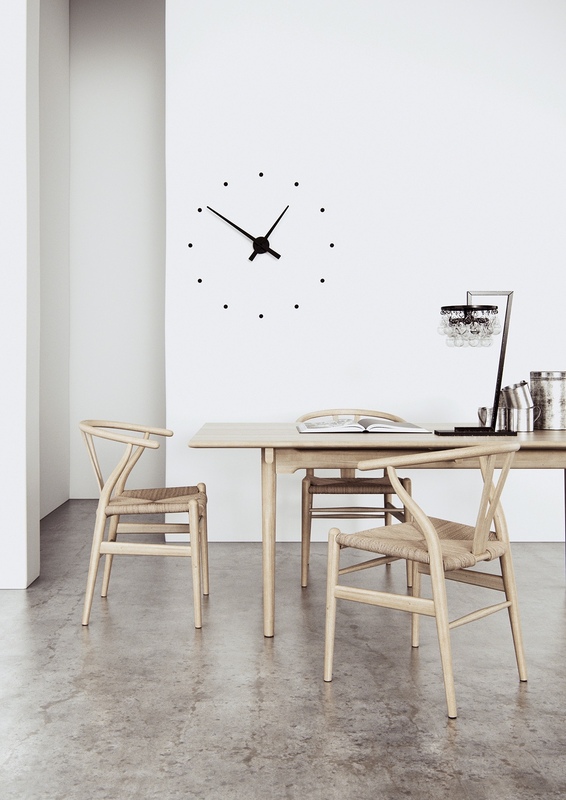 Let’s start with a light and wonderful dining room that balances Danish simplicity with luxurious undertones. 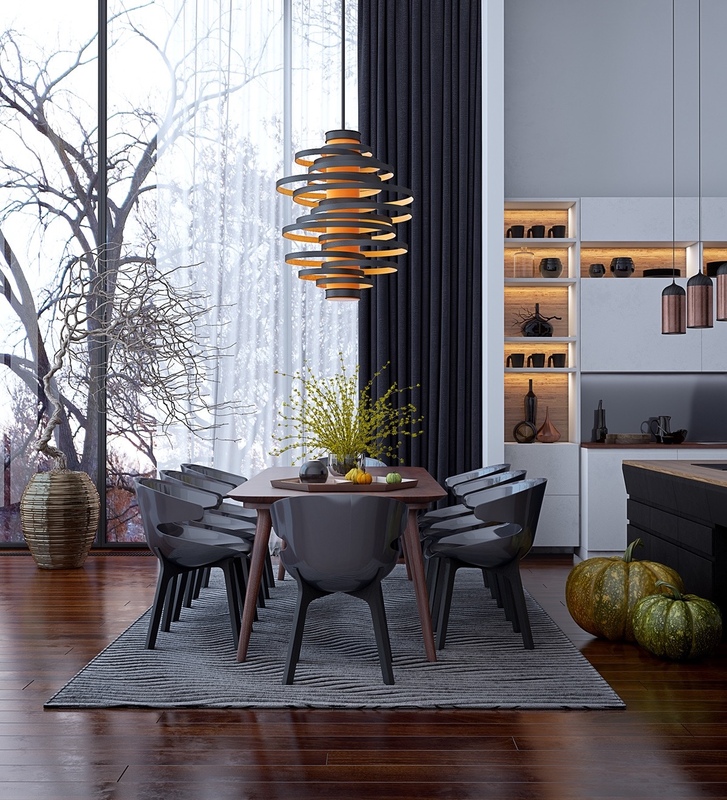 The pendant lamp above the table (Vertigo by Constance Guisset) is the standout piece that makes a simple interior like this one so effective. 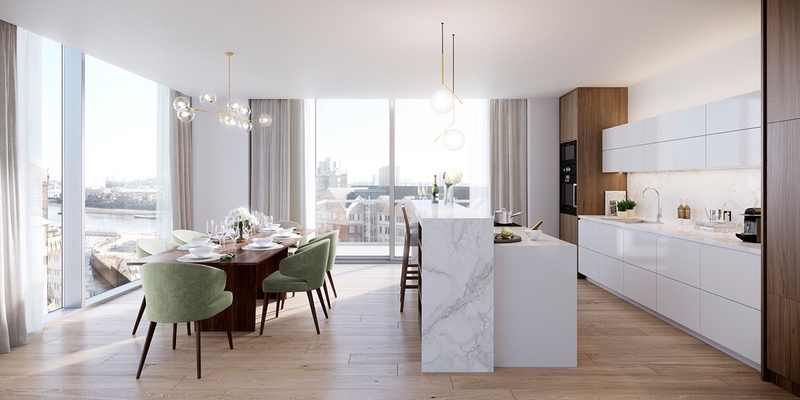 Marble makes a prominent statement in this dining room as well, its high-end appeal enhanced with designer brass lighting. The olive chairs are the work of Rodolfo Dordoni. 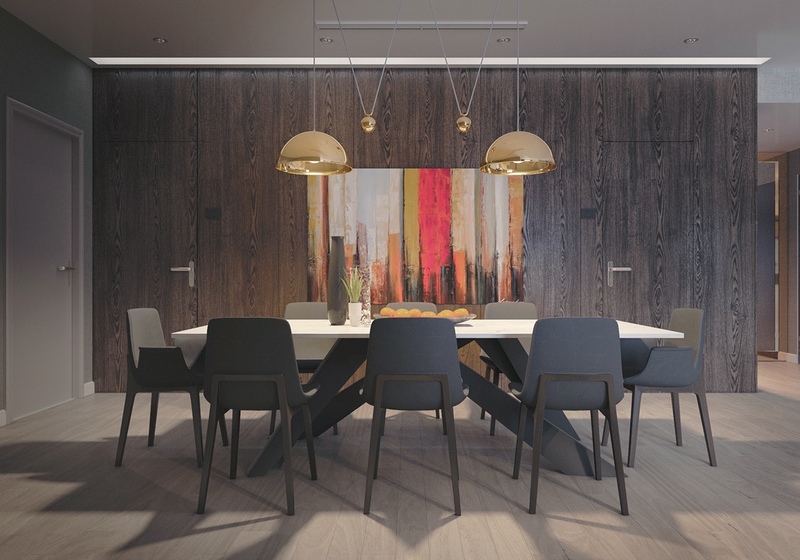 Modern and dark, this dining room goes big with dramatic appeal. The indirect lighting seems almost theatrical. Another dark color theme takes a softer approach with matte materials. The chairs are from the Ventura collection (2011) by Jean-Mari Massaud. Colorful! 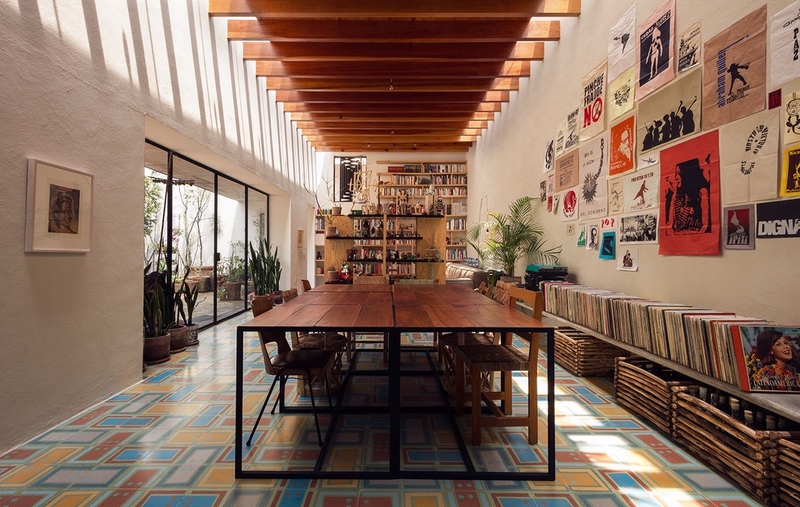 This dining room is a library for both books and music – allowing the residents to eat surrounded by the things they love. The creative floor tiles help bring the eclectic media-based interior together. Geometry is the prevailing theme of this colorful space. Dandelion yellow sets a sunny theme, while the single teal vessel draws the eye as an understated but irresistible focal point. As is evident from this image, a single contrasting color accent piece can draw the eye – be it a bowl, vase or pitcher. 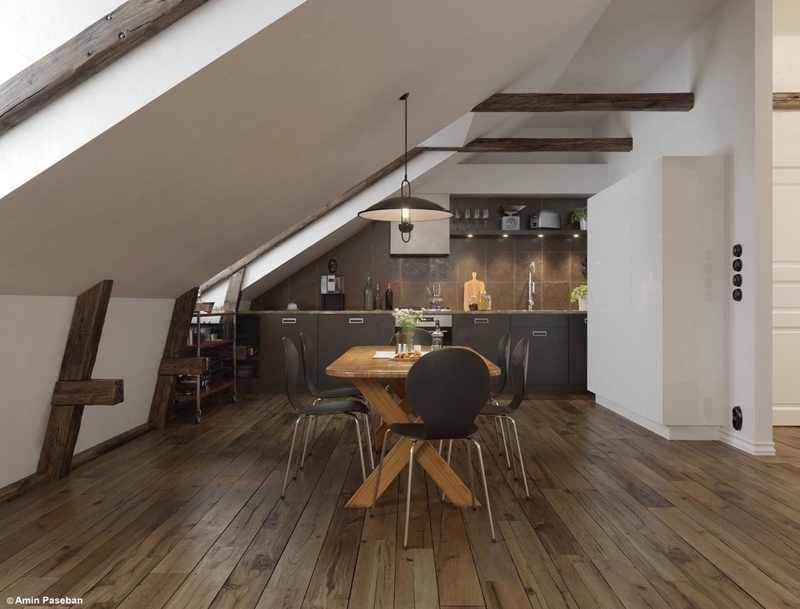 Modern minimalism meets rustic charm. Wood furniture and tin cups underline the homey appeal, with concrete floors and crisp white walls acting as a sort of neutral gallery in which to appreciate the composition. 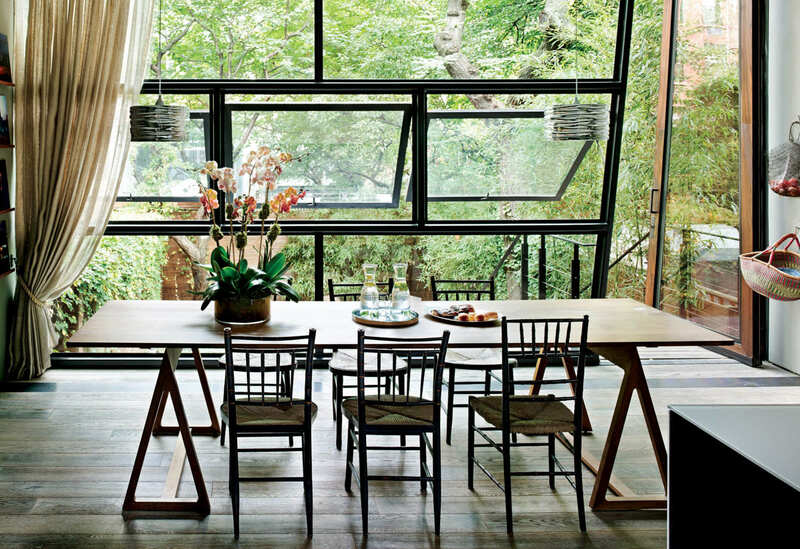 Hans Wegner’s famous Wishbone chairs reappear in this laidback dining room. The oversized Random Light by Bertjan Pot is another immediately recognizable piece. 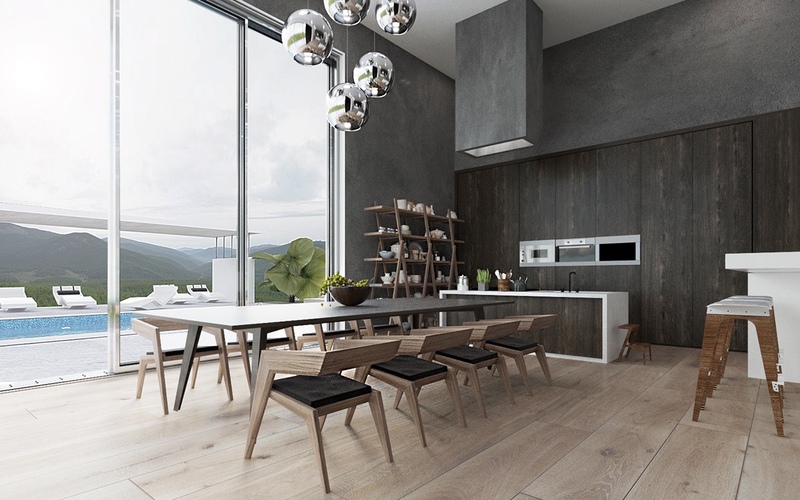 An emphasis on low-profile furniture and horizontal lines ensures the gorgeous mountainous surroundings take center stage in this kitchen and dining combination. This incredible garden view is everything. 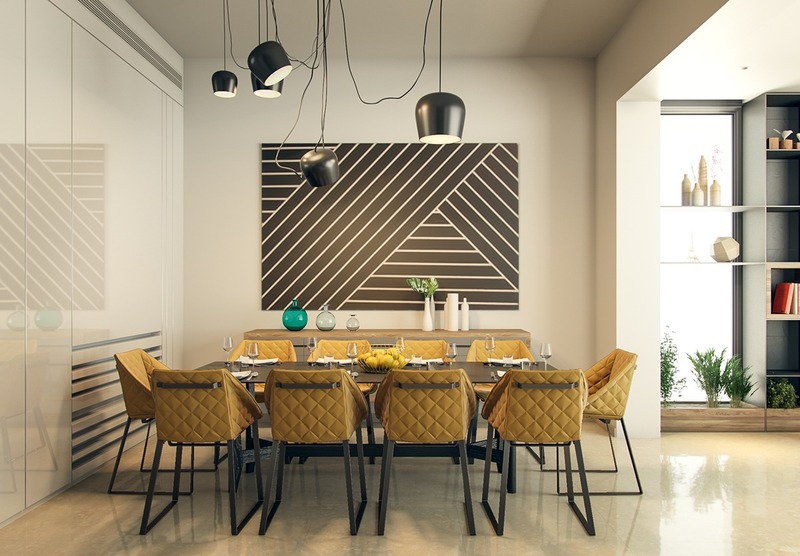 It informs not only the colors and materials used throughout the dining room, but also influences the structure of the table and chairs as well – the structural variation is natural, rebellious, and carefree. 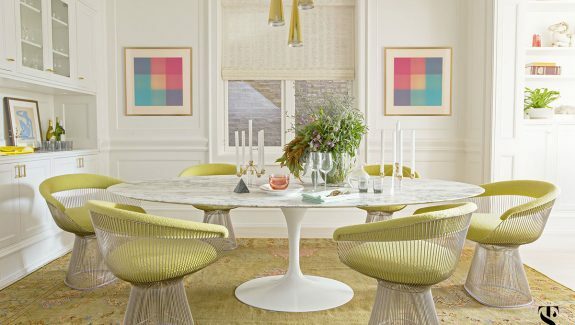 The table is the work of Jonathan Adler and the chairs are antiques. Cute! Eclectic chairs unify the white, black, and wood color theme used throughout this cozy kitchen and dining combination. 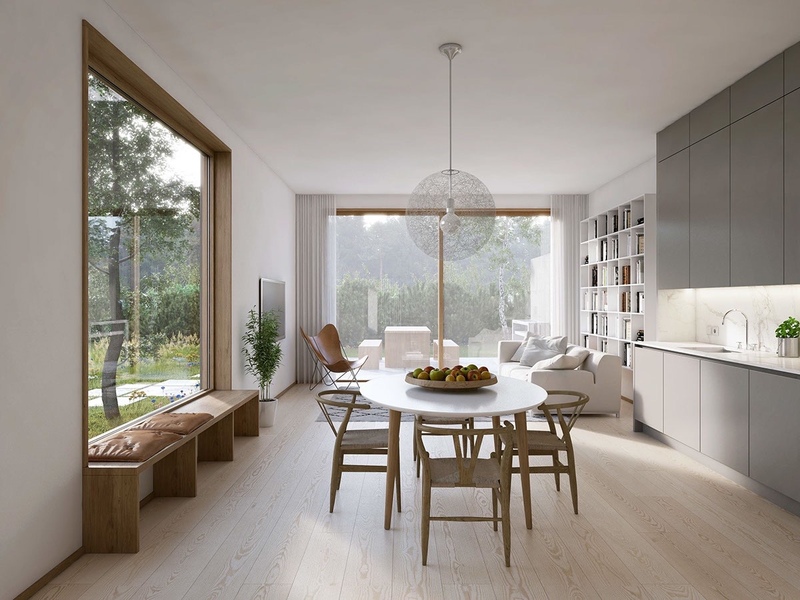 It’s interesting to see how the chair arrangement actually shifts the visual weight of the area, the warm wood on the right balancing the darker area near the breakfast bar to the left. 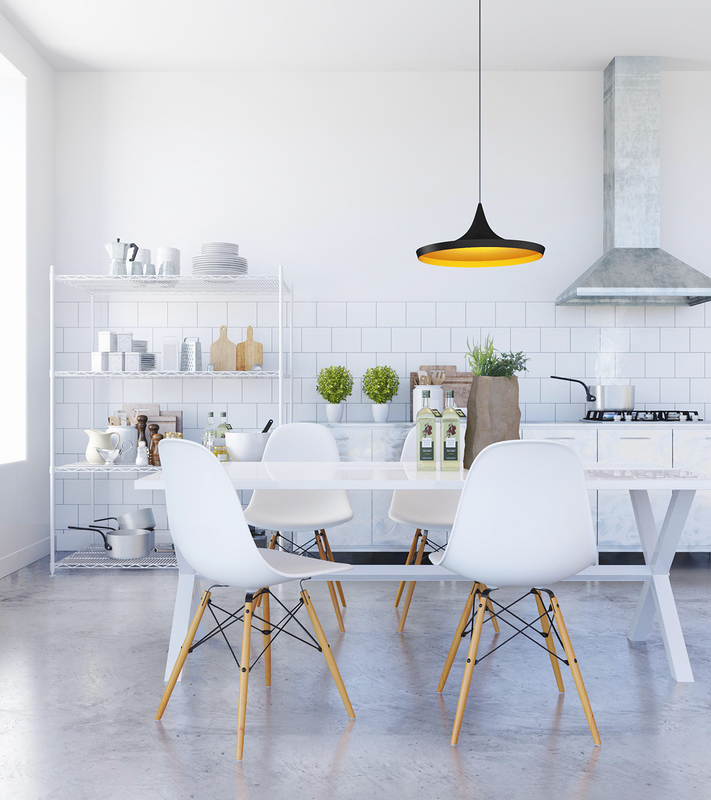 Octo pendants (by Secto Design) and classic Eames chairs could serve as a strong foundation for any dining room. It’s hard to go wrong with beloved selections like these. Located beneath a dramatic vaulted ceiling, this kitchen and dining combination embraces its cozy circumstances with dark colors and rich texture. Stone block walls can look monolithic and imposing at times. 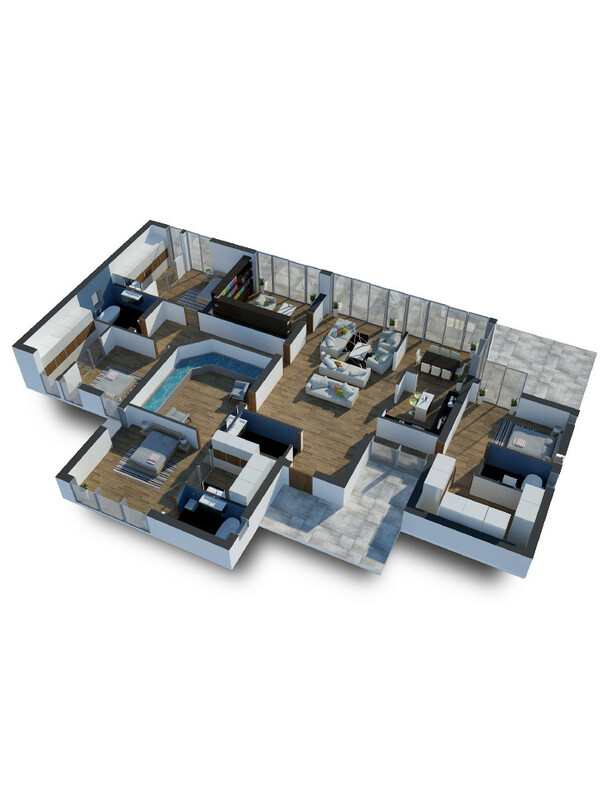 But here weighty materials actually draw out the lightness of the refined furniture and cabinetry selections. 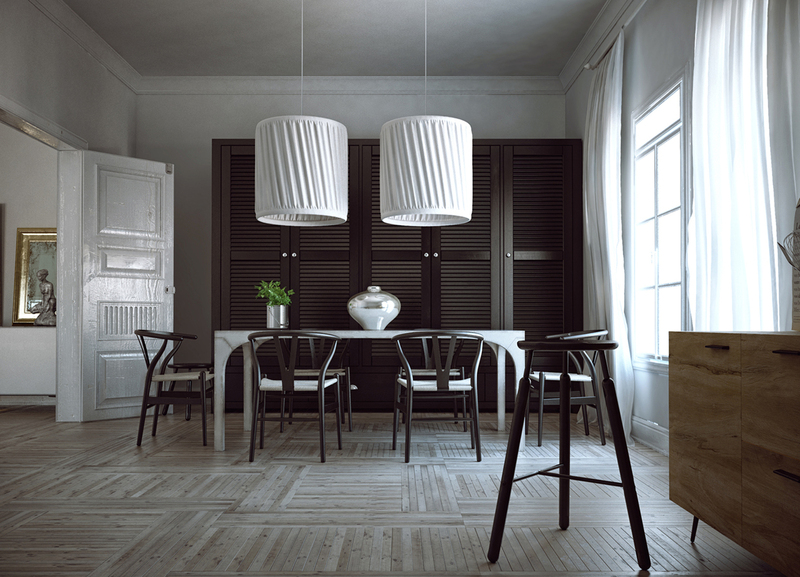 The Caravaggio dining pendant lights add a nice touch. 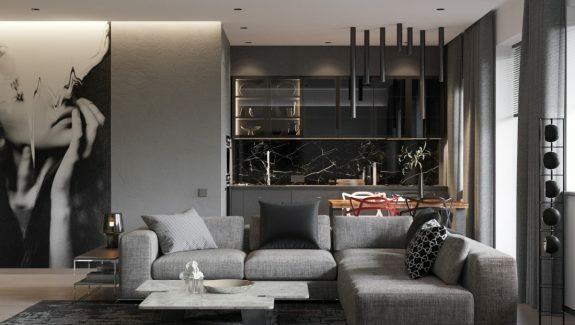 Modernism and classical details meet within this subdued space, crowned by the elegant chandelier that sparkles above. 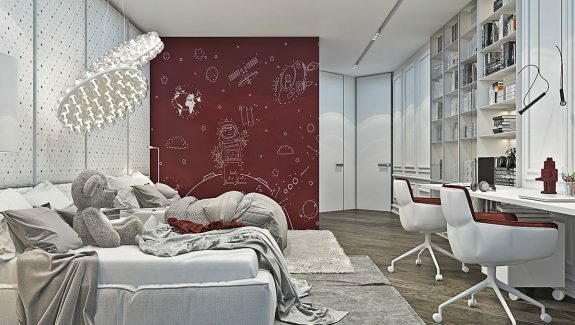 Maroon is an attractive complement to any greyscale theme – its subdued tone doesn’t pop out, but subtly bleeds warmth into the environment instead. 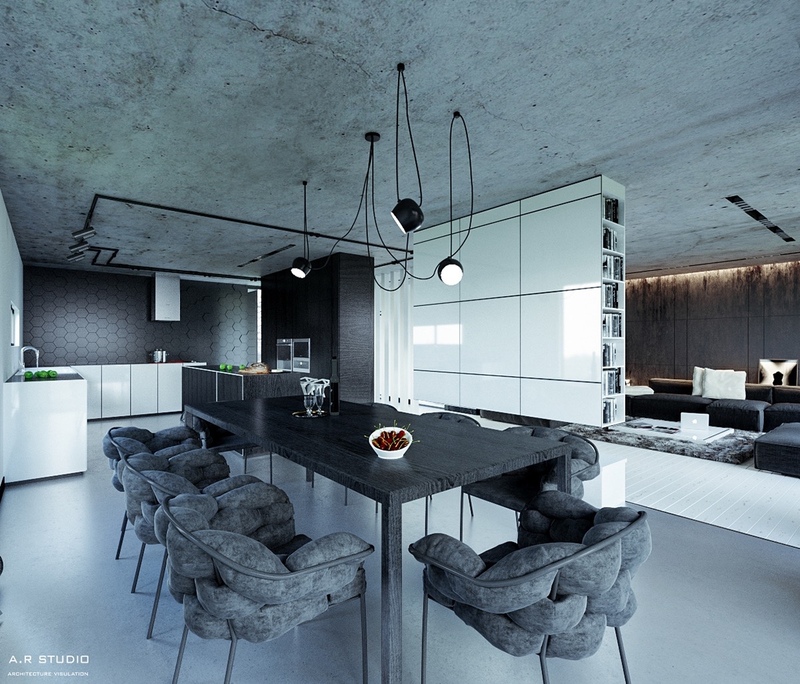 Textural variation allows this greyscale dining room to rise above its restricted color palette. The ultra-plush chairs are from the Serpentine collection by Eléonore Nalet and the lights are from the AIM series by Ronan and Erwan Bouroullec. 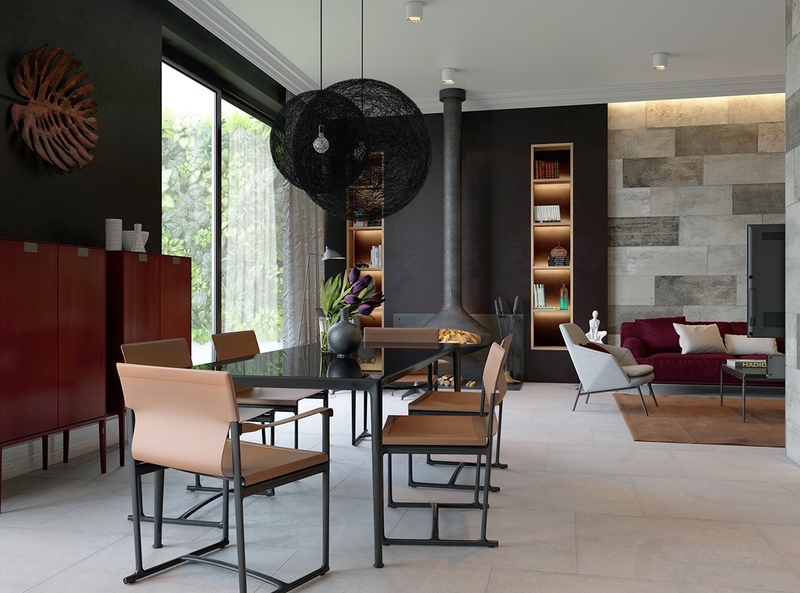 Black chairs blend into the black accent wall at the far end of this open living space. 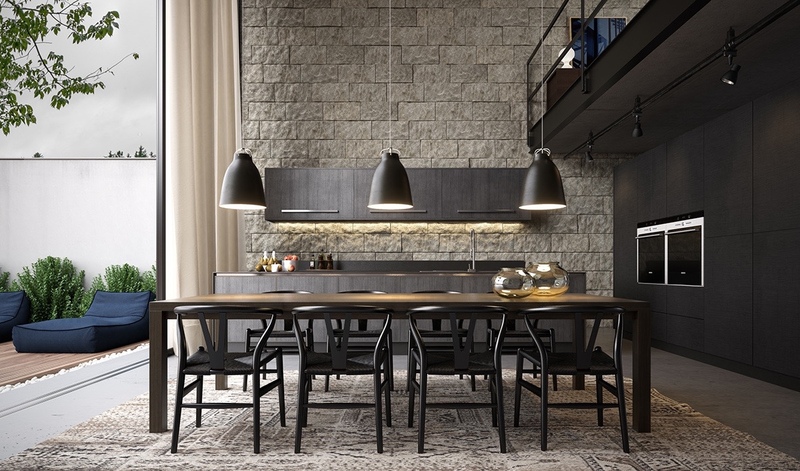 The one thing that stands out are the distinctive profiles of three Beat pendant lights by Tom Dixon. 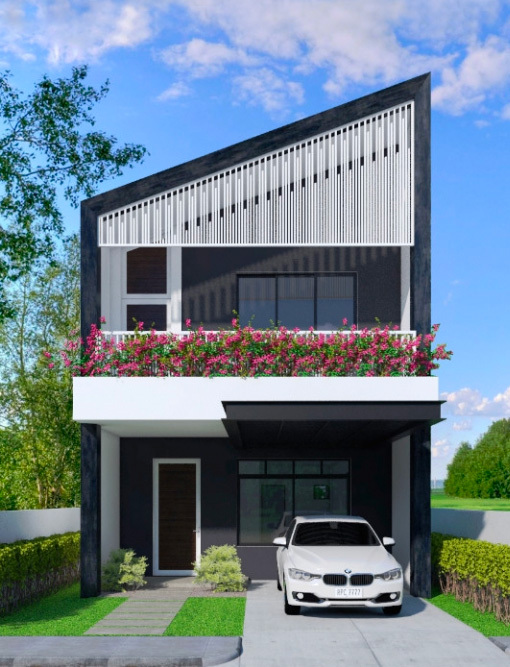 If a black-and-white color theme seems too spare for your tastes, but you still like the idea of adopting a modernist style, a cheerful dash of color is an easy way to make your interior truly your own. 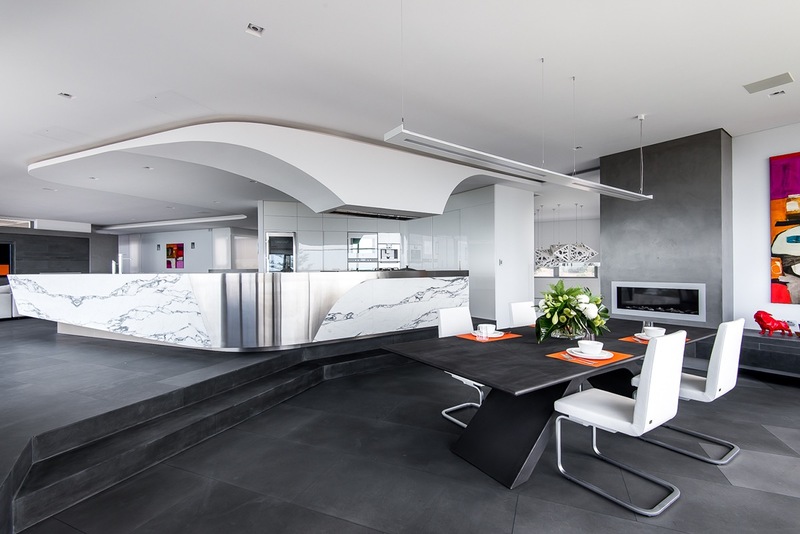 Futuristic and luxurious, this dining room uses dramatic sweeping angles to guide the eye from each functional area to the next. Richly-veined marble and slate floors stick out as the few natural materials used within – their contribution to the aesthetic cannot be overlooked. 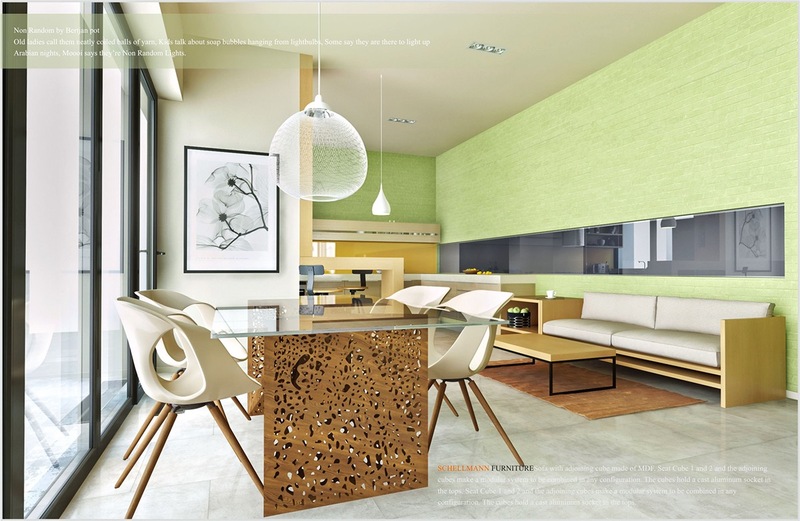 Here’s another interior where warm accents seem to affect even the deepest colors in the room. Daring color! Pistachio green isn’t a common choice for dining rooms but this interior shows that anything is possible with the right accent materials. 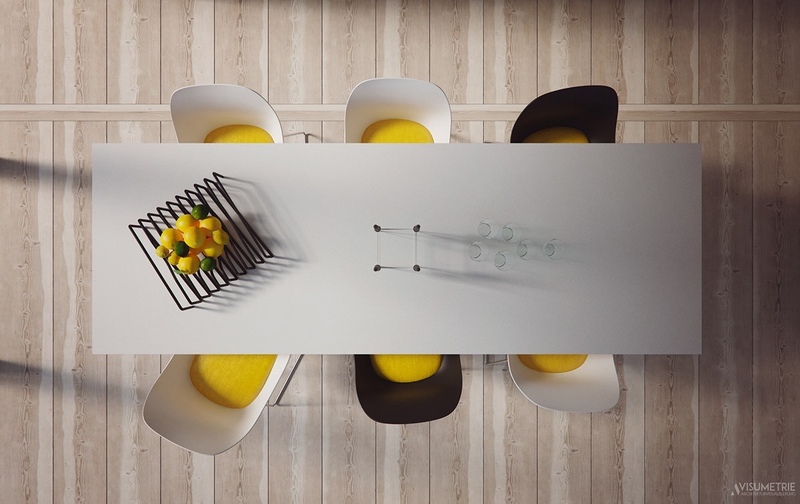 Warm wood creates striking contrast, an evolution from its usual role where it dominates every flat surface. High contrast palettes can make an especially dramatic impression in a home with classical details like this one. Any shift in perspective will completely alter the effect of the white elements against their matte black background. 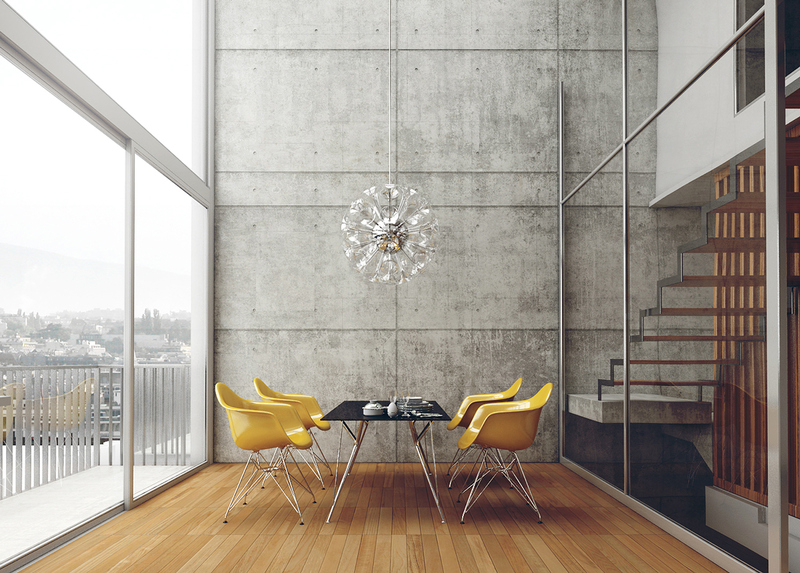 Industrial yet cheerful – tall concrete walls might otherwise feel imposing, but these spectacular yellow chairs lighten the mood and provide an irresistible focal point. Even within the urban interior, it’s hard not to think of floral themes with the combination of dandelion yellow chairs and the blooming chandelier above. And finally, a simple white dining room colored only by the hues of nature: the warm legs of the molded chairs and the plants’ verdant foliage. 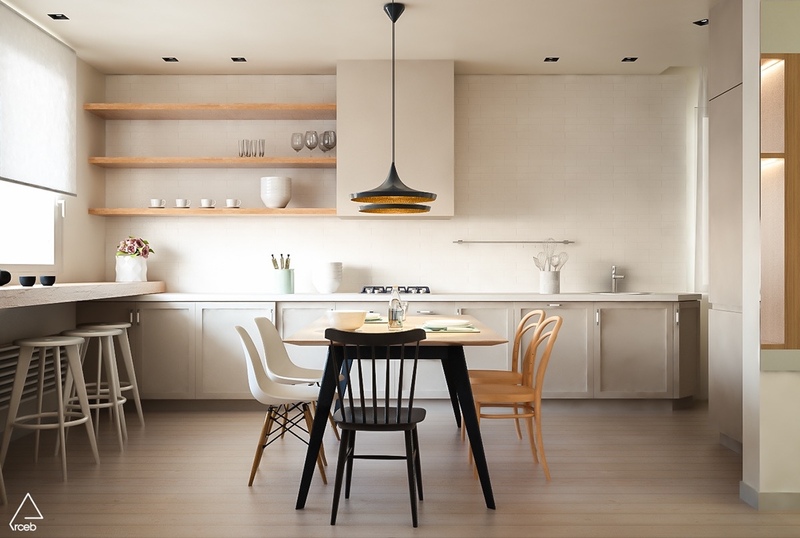 A single Beat pendant ties into the black fittings scattered throughout.